Notify your contacts by sending them an email about any changes to your event or simply as a reminder that the event is approaching. 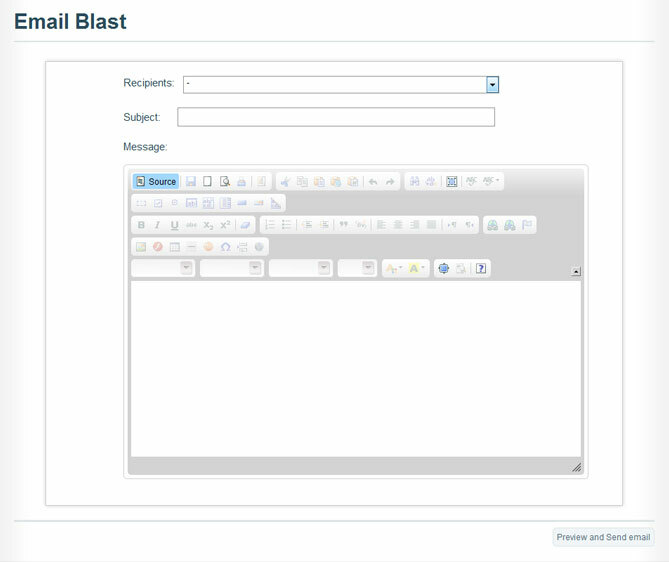 To access the email blast section click “Email Blast” along the top navigation. From here you can choose your recipient list based on individual event registrant groups. If you have a custom contacts list you can also select this from the drop down menu labeled “My Contacts”. When creating your subject line, avoid using the word “free,” TEXT IN ALL CAPS, repeating punctuation (????) or dollar signs ($$$$). Using these can cause your email to be sent directly to a spam folder and never to be delivered. The email body can be plain text and formatted using the text editor or you can use HTML in your msg by simply clicking the source button in the top left corner of the editor. Note: Many email readers do not like div layouts and prefer a table based layout using inline styled css. Once you are satisfied with everything you have created, simply click “Preview and Send email”. A pop up with display showing how your email will look. Click cancel to continue editing your email. Once you have previewed your email and you are satisfied, click Send email.